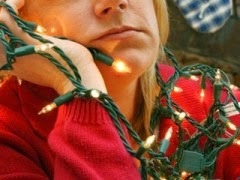 Holiday depression and depression in general challenges even the most optimistic people. Although it may be difficult, promise yourself that you will commit to having a positive attitude. * Do the best you can (perfection is not attainable). * Give yourself the gift of positive self talk. * Don't repeat negative message from the past that are not true. * Truly believe in yourself, including your goodness and self-worth. * Accept that life is not perfect. Injustices and suffering occur. It is normal at times to feel angry and to grieve. * Get help on how to manage these feelings. Depression can literally strip away self-esteem and the hope that things can get better. Depression can cause you to think in a very negative manner. But don't get discouraged. Get the help you deserve today. Share with us any tips you use on getting through holiday depression. For some, the holidays are an especially difficult time. For others, this is a joyous time of year. National Suicide Prevention Lifeline could help - 1-800-273-TALK (8255). You may go to the nearest hospital or emergency room. Call your physician, health provider or clergy. National Alliance On Mental Illness, at www.nami.org, Helpline: 1-800-950-NAMI (6264).